The Common Rail kit list details the Common Rail injector types and additional accessories that are required for All Makes testing on the AVM2-PC (with HK900), CRi-PC and IFT-200. 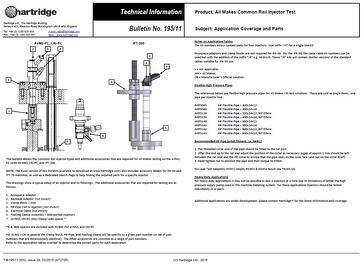 The Excel version of this bulletin also includes accessory details for IFR-50 and IFT-70 test equipment. To receive a FREE copy of our Common Rail kit information in your local language, simply fill in the form below.